The Creator of ALL galaxies knows your name! You may be insignificant to billions of people who walk the earth but you ARE NOT insignificant to God! God not only knows your name he also knows your hopes, your dreams, your fears, your burdens. Please note God’s use of the word “through” it would be nice if he’d used the word “around” instead but then I’d never have experienced God’s intimate involvement in my own life. Jesus not only died to save us but also so that we would have the Holy Spirit. And it is the Holy Spirit who rescues us from the dangers of walking through rivers and flames. Never in our lives has it been more important than it is now to put our trust in God’s faithfulness. 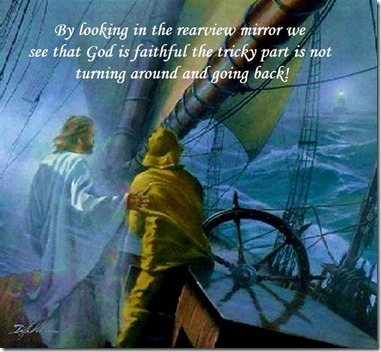 By looking in the rearview mirror we see that God is faithful the tricky part is not turning around and going back! Every minute of everyday God holds you firmly and faithfully in his heart. GOD IS FAITHFUL and you can take that with you in the minutes, hours, days, weeks, months, and years ahead of you!